The figures are clear and irrevocable, 2016 cruise season in Cherbourg is a record!!! We welcomed 26 calls, totalizing 51 963 cruise guests and 21 916 crew members. This year, 10 494, or 20,20 % of the total number of guests opted for half-day and full-day shore excursions ( the average since 2008 is 26,06%) . The best sellers are The D-day Landing Beaches, the Mont Saint Michel and the Saire Valley. 2 double calls took place. The 3rd of May, the luxurious Viking Sea and the MSC Opera have shared the Transatlantic Basin. The Viking berthed Quay of France and the MSC alongside the Quay of Normandy. The 30th of May, the FTI Berlin and the Prinsendam were both located Quay of France. Cherbourg received this year 4 unexpected calls. The Koningsdam, calling the 17th of May finally stayed till the 18th in the evening. The cruise ship Artania, initially planned in Guernsey, joined Cherbourg the 6th of June. The Aegean Odyssey stayed Quay of France from the 26th to the 29th of June. At last, the Mein Schiff 1 makes her first call in Cherbourg on the 20th of August; she was unable to berth at Falmouth due to bad weather conditions. 12 inaugural calls were welcomed this year: Ovation of the Seas, Royal Caribbean Cruises (18th of April), Regal Princess, Princess Cruises (27th of April), Zuiderdam (1st of May), Viking Sea, Viking River Cruises (3rd of May), Koningsdam, Holland America Line (17th of May), Sea Adventurer, Quark Expeditions (22nd of May), Costa Favolosa, Costa Cruises (23rd of May), Harmony of the Seas, Royal Caribbean Cruises (27th of May), National Geographic Orion, Lindblad Expedition (3rd of June), Aegean Odyssey, Voyages to Antiquity (26th of June), Mein Schiff 1, TUI Cruises (20th of August), Azamara Quest, Azamara Cruises (11th of September), MSC Musica, MSC Cruises (14th of September). In keeping with tradition, each time a cruise ship calls for the first time in our port, a ceremony is organized on board, the representatives of the Port and Town of Cherbourg give to the Captain of the vessel gifts, a basket of local products and the traditional Plaque. 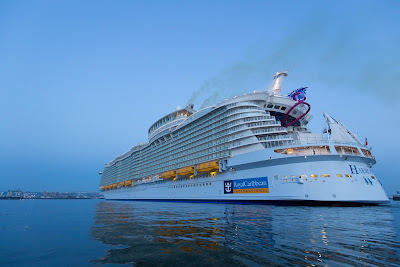 The most remarkable event of the year is undoubtly the amazing call of the largest cruise ship of the world : HARMONY OF THE SEAS, fresh out from Saint Nazaire Shipyards, she brought us 5250 cruise guests and 2317 crew members! Not to forget, the 2 calls of the huge Ovation of the Seas, 18th and 28th of April, that opened this incredible cruise season and the return of Cunard Line with the Queen Elizabeth call, the 6th of October.